We GMT ENGINEERS PVT LTD introduce ourselves as one of the Leading Machine Tool Dealers in Chennai and specialists in Sheet Metal / Tool Room machines for your wide variety of work. Our company was founded in the year 1988 by founder Late Sri V. K. Bhaskaran a veteran of 5 Decades experience in Machine Tools. The business is being managed by Mr.B.Saiprasad since 1994. A Graduate in Tool and die making from NTTF Bangalore. His expertise in Tool and Die Making rooted in design, manufacture, try out, customer relation and with rich experience in the business of suggesting / selling machine tools for the past two decades. Company has more than two decades of expertise in the line of Sheet Metal Machines & Tool Room Machines. Identifying and translating VALUE FOR MONEY products as solutions for our clients and supporting them with an Ultra efficient Spares / Service backup. Many of our sales personnel are trained and have been working in this company for more than a decade. Our Company’s strength is a competent service team to take care of the after sales service to the extent that we receive repeat orders from our existing Customers on a regular basis. Service Engineers are technically qualified. All the above skilled service personals are trained at various Principles factory. We send our service engineers frequently to our various Principles in India and abroad for updating technical skills by rotation. As a company the value of service to customer is well & truly understood and therefore we could claim to have the best service team among contemporary business concern. Finally we would like to highlight a few points which would help you to make a decision on mutual favour. After Sales service has been our strong point and this is vouched by our Customers. We have sold more than 1000 machines in the Sheet Metal line and hence have immense knowledge on the working of the machines and maintenance of the same. Service Engineers stationed at Chennai, Bangalore, Coimbatore and Hyderabad are highly experienced. Long line of satisfied Customers who give us repeat orders. We are the largest supplier of Shearing Machines & Press Brakes in Chennai. Pre-Delivery Inspection of factory premises for appraising client for installation needs. Commissioning of machinery and training of your operators by factory trained personnel. Preventive maintenance to reduce breakdowns, and reducing downtime during the odd breakdowns that may occur. Building a rapport with the client organization to ensure repeat orders/referrals. Southern Railway Brakes India Ltd.
Madras Radiators and Pressings Pvt. Ltd.
Services, Trading, Importer and Exporter of Punching Machine And Metal Machine. Our company possesses skilled and highly trained employees, working in close association with each other to achieve the set targets of an organization. They perform cordially to accomplish the specific targets within promised time. We trained our personnel by conducting seminars as well as training sessions for them on regular intervals. We have a sound and well-equipped facility of infrastructure, where all our operations are carried out systematically by specialized team of experts. Our infrastructure spread across a wide area, thus, we have made its categorization properly into several departments such as production, quality checking, sales and marketing, logistics and many more. We strictly adhere to quality international quality norms in procuring various high precision machines. Our endeavor revolves around bringing complete client satisfaction by understanding their requirement and then sourcing machines that offers the desired results to our esteem clients. With the help of our market analysts and procurement specialists we have been able to fetch superior machines and thereby adding new clients to the existing lists. Madras Radiators & Pressings Pvt. Ltd.
BST Press Metal Components Pvt. Ltd.
G.M . 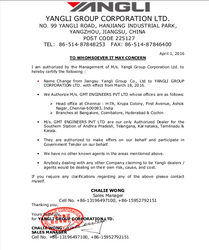 Pens International Ltd.
T.I. Diamond Chain India Ltd. The products that we are offering our clients have curved a niche in the market for the quality they deliver. these has gained us name and fame. the credit of our sucfcess goes to our vendors too, who deliver us quality products and help us in maintaining TAT. We have appointed a number of skilled people in our company to percolate through different tasks. With their unflinching efforts, we are regularly touching new insights in the industry.